"Mr. Houtkin has provided the reader with a wonderful education on a great strategy that has the potential to turn a very limited risk investment into an extraordinarily high return. He makes the critical distinction between penny stocks and serious opportunities available to the low-priced value investor using important examples of his own methodology. Along the way, Houtkin provides valuable insight into some of the inner workings of Wall Street." 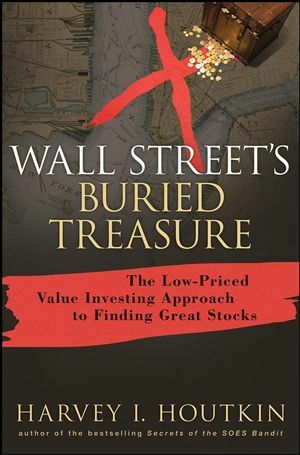 "Investing without Wall Street's Buried Treasure is like trying to live without food. Mr. Houtkin provides the facts of survival one needs to make money in any market. He reports the truth that no one else wants to state. This is a playbook for success; a forty-year apprenticeship is explained right between these covers! Take advantage of it." Harvey I. Houtkin is a well-known player in the electronic trading arena. Named by CNBC as "one of the five in history who made it happen on Wall Street" and commonly recognized as the "father of electronic trading" and the "father of day trading," he possesses unsurpassed real-world expertise. Houtkin is Chairman and CEO of Domestic Securities, Inc. He has lectured at numerous forums domestically and internationally, and has been interviewed in a variety of media. He holds an MBA and a BBA from Baruch College. Chapter 1. Overcoming the Conventional Wisdom. Chapter 2. Wall Street's Buried Treasures. Chapter 3. Doing Your Homework. Chapter 4. Public Shells and Reverse Splits, Options, and Warrants. Chapter 5. Overcoming the Obstacles. Chapter 6. Getting an Overview of the Marketplace. Chapter 7. A Classic Low-Priced Value Stock: Sportsman's Guide (SGDE). Chapter 8. Come and Get It: Aptimus, Inc. (APTM). Chapter 9. Forgotten Stocks that Fill a Niche: Aduddell Industries (ADDL). Chapter 10. A Lesson in Management: Gencor Industries, Inc. (GENC). Chapter 11. More Illuminating LPVS Situations. Chapter 12. Starting Your Treasure Hunt.